Long gone are the days when IT was confined to siloed divisions within a bank. Today, digitalisation impacts every branch, at every level and across all departments of any financial institution worth its salt. As the past year has demonstrated, banks have little choice but to embrace the digital revolution wholeheartedly. An ongoing transformation is the result, while those that continue to be slow to adapt are now suffering the consequences. Nowadays, consumers demand the utmost in convenience. They can purchase pretty much anything online at the touch of a button, at any time – day or night – and they expect no less from their financial service provider. But with this mammoth rush in online banking comes the pressing and growing need for security. Recent years have demonstrated the danger of the cloud’s double-edged sword, and everyday consumers are all too aware of the ease with which organisations can be hacked. Consequently, in 2017, we saw major advances in banking security, with the use of biometric authentication and iris recognition providing a much-needed additional level of security for customers. That said, despite their importance in today’s digital world, such developments are not yet ubiquitous. Over the past year, the continued march of banking’s digital transformation has forced many to rise to associated challenges and evolve with the times, while others gradually fade away, soon to be forgotten in the brick-and-mortar branches they seem so reluctant to leave behind. In this year’s World Finance Digital Banking Awards, we celebrate those that lead the way with digitalisation, while meeting consumer demands and mitigating against accompanying risks along the way. Fintech firms are continuously finding new and innovative ways to make managing, investing and spending money easier than ever before. In this vein, perhaps the biggest change that we have seen in the past 12 months has been the rising popularity of digital currencies. In 2017, we witnessed something that few would have predicted just a few years ago: cryptocurrencies going mainstream. While bitcoin remains the most well-known cryptocurrency, a growing number of rivals are proliferating at an astonishing rate. The second in popularity is Ethereum, while others following closely include Litecoin, Zcash, Dash and Ripple. Aptly demonstrating the current trend is their growth in value witnessed over the past year. For instance, in the months from January to July 2017, Ethereum increased its value fiftyfold to $300 a coin. By August, Litecoin reached just above $64.20 per coin, exploding in value by almost 1,383 percent from the start of the year, when it was trading at just $4.33. Unsurprisingly, amid such news, bitcoin had its biggest ever year in 2017, reaching over $15,000 per coin in December. Meanwhile, the volume of daily bitcoin transactions took off in May, from an average of $200m in the months prior to more than $700m being common for the rest of the year. Against this backdrop, big banks have started to act, all too aware that they could easily miss a beat that could one day make them obsolete. By the summer, Ashok Vaswani, Chief Executive Officer for Personal and Corporate Banking at Barclays, revealed that discussions were underway with British regulators to introduce digital currencies. “We have been talking to a couple of fintech companies and have actually gone with them to the [Financial Conduct Authority] to talk about how we could bring an equivalent cryptocurrency, not necessarily bitcoin, into play,” Vaswani told CNBC at a fintech conference in Denmark. Barclays is not alone in this endeavour; central banks throughout Asia and Europe are also exploring digital-only currencies. Denmark’s central bank has been deliberating a digital-only e-krone for over a year now, while the People’s Bank of China has already run trials on its own currency. Meanwhile, in June, tech giant IBM announced a new deal to construct a digital trade platform with the Digital Trade Chain Consortium, a group of European banks comprising Societe Generale, Deutsche Bank, KBC, Rabobank, Natixis, Unicredit and HSBC. As such snippets – which are by no means indicative of the whole story – show, 2017 has been a monumental year for digital currencies. And it seems this is only the start: financial institutions all over the world are now scrambling to latch onto the trend, something we can expect to see long into 2018 as well. While in 2016 we witnessed the rise of small and nimble fintech firms, along with the start of a movement that saw them team up with traditional banks, throughout 2017, we have seen a growing incidence of partnerships with big tech firms. Aside from the mammoth IBM and Digital Trade Chain Consortium alliance, there are also several others highlighted in the World Economic Forum’s (WEF’s) Beyond Fintech: A Pragmatic Assessment of Disruptive Potential in Financial Services report, which was published in August 2017 and alludes to a major disruption that could well be underway. The report lists artificial intelligence, cloud computing and big data analytics as the main three areas that have become critical to maintaining competitiveness in the financial sector. Interestingly, it is these capabilities that the giants of the tech world already have deep levels of experience and expertise in, far exceeding their financial counterparts. Embracing such solutions is proving to be difficult for the banks trying to play catch-up, with more institutions turning to the likes of Google, Facebook and Amazon. Among the most notable examples given by the WEF is Amazon Web Services’ partnership with numerous finance companies, including Nasdaq, Aon, Carlyle and Pacific Life. There is also Banco Bradesco’s partnership with Facebook, which enables customers to carry out their daily banking activities on the social media platform. This uses Facebook’s highly sophisticated data analytics to better target existing and potential customers. Meanwhile, Amazon’s Alexa solution is now provided to Capital One and Liberty Mutual, enabling customers to pay bills and track their spending through voice-activated devices. Although such cooperation is facilitating and encouraging innovation in the sector, the report notes that it could also pose a risk in the event that big tech players decide to enter into the financial services game themselves, placing them in direct competition with banks, but with a massive technological advantage. “Tech giants would be able to pick and choose their points of entry into financial services; maximising their strengths like rich datasets and strong brands, while taking advantage of incumbent institutions’ dependence on them,” said Jesse McWaters, lead author of the report, on the WEF’s website. There has been a lot of change over the past year, with financial institutions proving to be more willing to adapt, implement new technology and partner up. But what 2017 has also indicated is that the game is becoming fiercely competitive, and new rivals may not just be limited to the small fintech players that banks had previously come to terms with. As such changes continue to rain down on the industry, flexibility and forward-thinking is more important than ever. 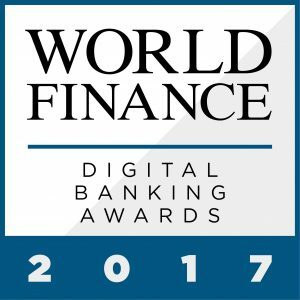 Those who stand tall in the face of such challenges, while embracing the new and unknown, are commended in the latest edition of the World Finance Digital Banking Awards.